As the second largest city in Saudi Arabia, Jeddah is slightly more cosmopolitan than the rest of the country due to its capacity as a port city since the 7th century. 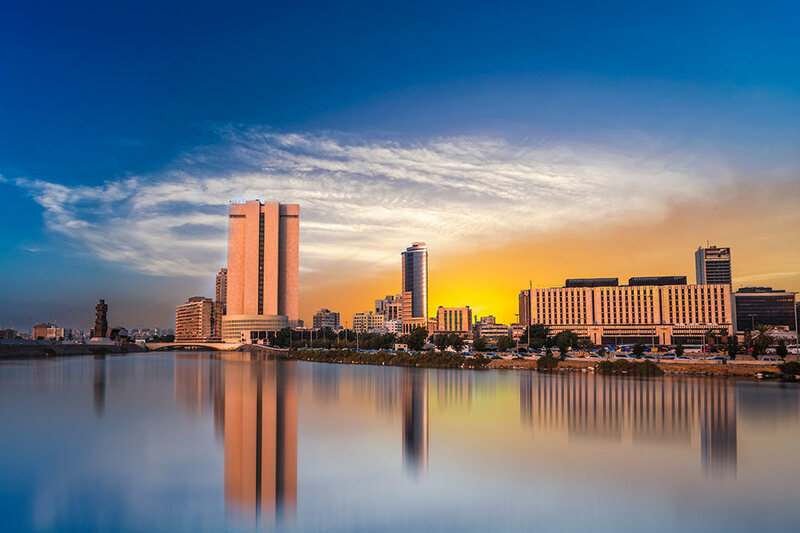 Used as a gateway for the city’s bustling business district as well as for pilgrimages to Mecca, Just Fly Business can help get you there in style with business class flights to Jeddah. No matter the reason for travel, your personal travel specialist at Just Fly Business can plan and book your upcoming trip to suit your needs. We have contracts with a large range of suppliers so that we can offer competitive prices on hotels, car hire, transfers, and tours, as well as arranging cheap business class flights to Jeddah on all major airlines. Business class flights to Jeddah are the best way to prepare yourself for your time in the city. With fully lie flat beds ensuring you arrive refreshed and the service of a premium cabin providing restaurant quality meals and personal touches, travelling to Jeddah from London or the UK will make the journey half the fun! Just Fly Business’ team of friendly and professional consultants work to provide the best value option for your desired trip, and best of all, it might not cost as much as you think. Why not contact our knowledgeable team to find your cheap business class flight to Jeddah today. Sometimes known as the Jeddah Fountain, this colossal water display was donated to the city by King Fahd in 1985. Located off the coast, it is the tallest fountain in the world, spraying water over 250m into the air, and can be seen from almost anywhere in the city when running. Insider’s Tip: The fountain only comes on at dusk and continues into the night, lit up by hundreds of lights to make a spectacular display! 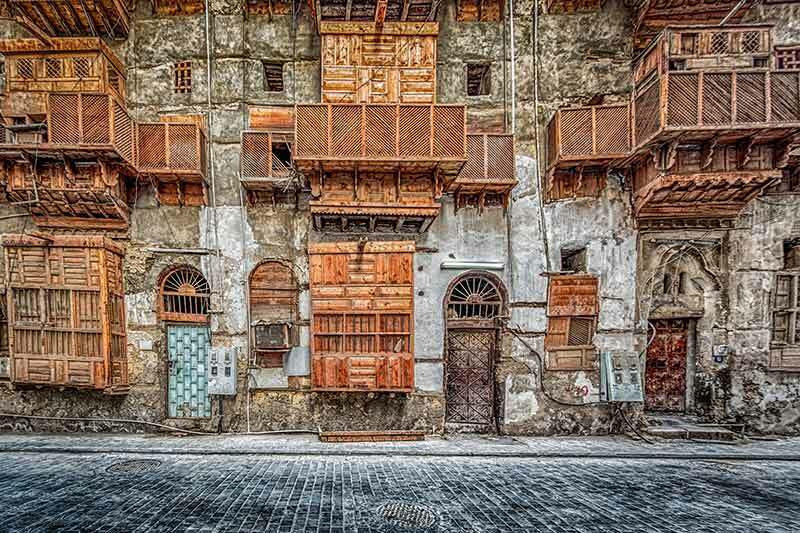 This historical neighbourhood is one of the oldest in Jeddah, dating back to the 7th century. Translated literally as “The Town”, Al Balad is listed as a UNESCO World Heritage site and offers visitors a respite from the traffic and shopping malls. Local souks selling everything from textiles to spices and food can be found mixed amongst the shops and apartments made of coral from the Red Sea, and although many have become decrepit others have been partially preserved and continue to be inhabited as they have always been. Insider’s Tip: Although a fascinating district of the city, Al Balad is not a common tourist area but is richly rewarding for those looking for something different and quintessentially local. 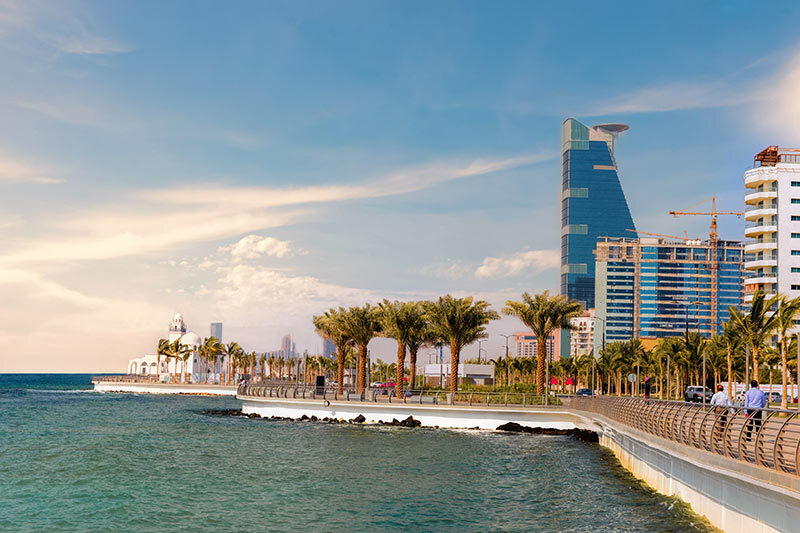 Stretching for over 20 miles along the coast, the Jeddah Corniche is a series of parklands, walking trails, sculpture parks, beaches, and mosques. Recently redeveloped in 2017, Corniche is split into two main parts. The city section, with views of King Fahd’s Fountain and the Al-Salam Royal Palace, is usually busy in the evenings and weekends with concerts and festivals enjoyed in the cool sea breeze. The North Corniche is longer and includes amusement parks, resorts, and the Fakieh Aquarium. When the heat becomes unbearable, Jeddah has no end of options to escape to air-conditioned comfort and conduct some retail therapy at the same time. The Red Sea Mall in North Jeddah is one of the biggest, offering visitors both high-end international brands and traditional products, as well as a history section where visitors can walk through the pages of time. Sophisticated elegance with stunning views from several meeting and event spaces, The Ritz-Carlton will cater to your business needs in style. 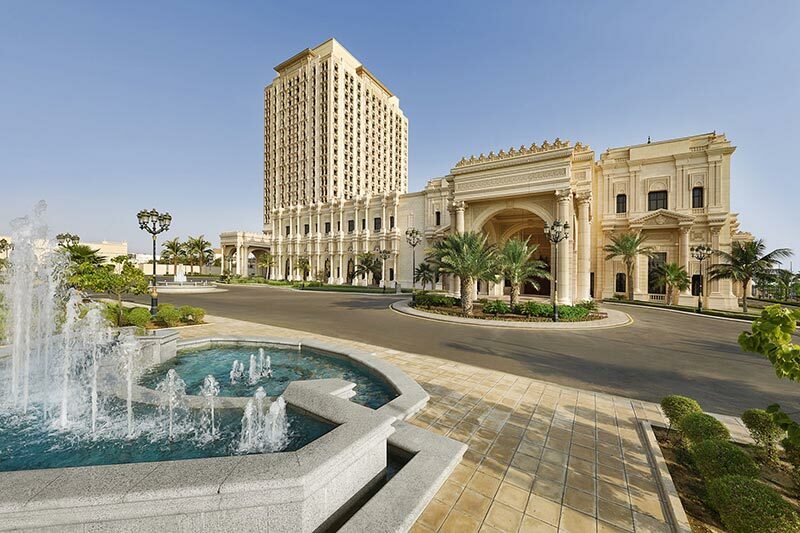 With views of King Fahd’s Fountain and an expert team of specialists to help, the InterContinental Jeddah can take the hassle out of your next business meeting or event. A major entry point into the Kingdom of Saudi Arabia, flights to Jeddah are the best option for Muslims on pilgrimage to the holy city of Mecca. The capital of the country, Riyadh, lies over 600 miles to the east, closer to the Middle-Eastern cities of Dubai and Doha, making Jeddah isolated with not many cities close by. Who Operates Business Class Flights to Jeddah? British Airways and Saudia both offer business class cabins on their direct flights to Jeddah. For business travellers this is important to ensure a comfortable and uninterrupted trip so as to arrive ready for your meeting. This is especially true on overnight flights when lie flat beds, lounge access, and priority boarding and baggage become essential to the busy traveller. Other Middle-Eastern carriers such as Emirates and Etihad operate a single connection service through their hub cities of Dubai and Abu Dhabi respectively. With good connection times and a high quality of service and comfort in their business class cabins, these may be a great alternative if direct flights are not essential. Regardless of taking a direct or indirect option, the best way to make sure you arrive at your destination feeling great is to book business class flights. Utilise the pre-departure and onboard facilities to finish off any final preparations for your meeting or enjoy a meal and beverage in the business class lounge before take-off. Inflight, stretch out and relax with ample room and get a good night’s sleep in your lie flat bed. Just Fly Business can help get you cheap business class flights to Jeddah, saving you time and often better value than booking direct with the airline. Contact your professional consultant today on 0208 417 1366 to find out how we can help you.